TruBioTrim is a dietary supplement meant to assist in the body’s ability to burn fat and reach one’s weight goal. It contains a special probiotic formula that aids in fat loss, boost metabolic rate, and reduces fat storage, among other benefits. This product is manufactured by NiGenBioTech, but not enough information about the company can be found on the site. The page describes the benefits the product may bring, and there is even a contact number to access for any queries customers would have. The bottle of 120 capsules sells for $59 on the website and a discount bundle of three bottles for $118. TruBioTrimcontains a fat-burning formula made up of probiotics. The formula is designed for the user to lose weight, decrease belly bloat, boost metabolic rate, burn fat, support digestive functions, and improve energy levels. Probiotics aids in weight loss as it helps relieve gastrointestinal discomforts like diarrhea, occasional constipation, and gas. It also alleviates belly bloat which enhances a better-looking figure. This supplement will help you achieve optimum results when used in conjunction with a diet and exercise regimen appropriate for the user. The result is a firmer, trimmer, tighter, and healthier body. TruBioTrim Ingredients – Are they Safe & Effective? The website does not enumerate any ingredients aside from mentioning the probiotic strain in the product. Probiotics: live microorganisms that promote a healthy digestive tract and boost the immune system. What are the Advantages of TruBioTrim? What are the Disadvantages of TruBioTrim? Exact dosage can’t be found on the website, but a bottle of 120 capsules is good for a month’s supply, making it two capsules a day. It is recommended to read package label completely for the proper administration of the supplement. 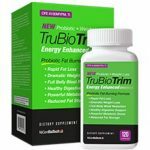 TruBioTrim appears to deliver its promise of weight loss, increased energy, and overall health. Its drawbacks, I might say, is the lack of information on the ingredients and scientific proof of its efficacy. Many other similar supplements may even offer more benefits, and with complete ingredient information, manufacturer background, and a more affordable price, TruBioTrim may have some competition going. Still, TruBioTrim has good customer reviews, so this may be a reasonable choice after all.